The Starjammer's attack Black Knight while Professor X & Cyclops meet with the Avengers. #350: Starjammers Raza & Hepzibah meet with a former Kree admiral, who hires them to assassinate the Avenger Black Knight, killer of the Kree Supreme Intelligence, offering Hepzibah money and a reluctant Raza information as to the whereabouts of his believed-dead wife & son. On Earth, Professor X & Cyclops meet with the Avengers, along with Val Cooper & Quicksilver, to inform them of renewed activity involving Magneto's Acolytes, and the potential threat to Quicksilver & Crystal's daughter Luna. Later, after Hepzibah convinces Corsair to take a trip to Earth to check on their teammate Binary, recovering with the Avengers, the Starjammers arrive at Avengers Mansion. During the ensuing gathering, Raza slips away and attacks Black Knight in the hanger. Black Knight seems to have the upper hand, until Raza threatens Luna, leaving Black Knight open to a killing stroke as he tries to save her. 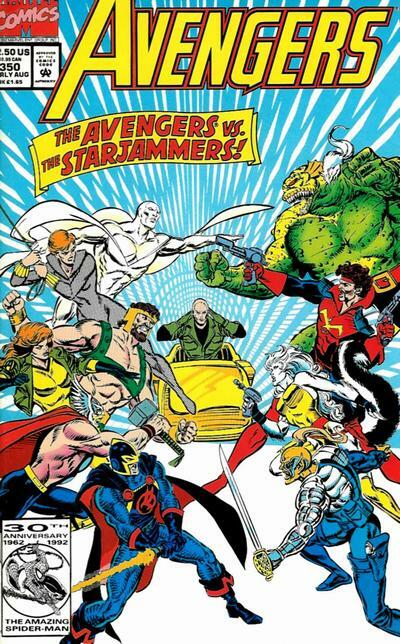 Alerted by the commotion of their fight, the Avengers & Starjammers rush into the hanger to find Raza standing over Black Knight, and an enraged Hercules declares that for killing Black Knight, Raza must die. #351: With Ch'od's help, Raza escapes from the Avengers. While Binary joins a group of Avengers to help hunt them down, Quicksilver summons the Inhuman's chief healer to assist Starjammer medic Sikorsky in saving Black Knight's life. After cornering Raza & Ch'od in an alley, Binary convinces the Avengers to stand down as she talks to Raza alone. 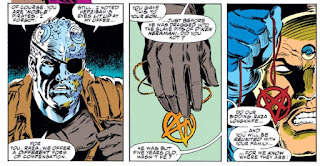 Learning the truth behind his motivations for attacking Black Knight and realizing the impossible situation the Kree put him in, she covers for him, saying he was brainwashed by the Kree. Back at the mansion, Black Knight is stabilized, and the returning contingent of Avengers & Starjammers interrupts Hepzibah's attempt to poison him as he recovers. 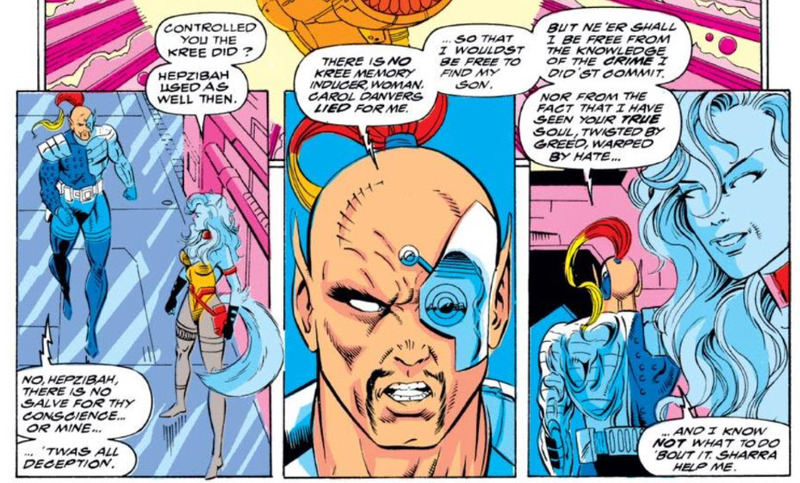 Giving apologies once more, the Starjammers depart, though Raza remains uneasy about Hepzibah's actions. These issues deal with the fallout from "Operation: Galactic Storm", a massive crossover storyline that ran through the various Avengers books (including the solo titles of many of their members) a few months prior. In that story, Earth gets caught in the middle of a war between the Kree and the Shi'ar Empires (specifically, a stargate near the sun used as a point of transit from the empires threatens to cause the sun to explode, leading the Avengers to intervene on both sides in an effort to stop the war and end the threat to Earth), which ends when the Kree Supreme Intelligence willingly decimates the vast majority of its own people in an effort to jumpstart their stagnant evolution, an act which leads a contingent of Avengers (over the objections of Captain America) to kill the Supreme Intelligence in retaliation (with Black Knight the one to strike the killing blow), thus leaving the Shi'ar the victors and Lilandra ruler over the remnants of the Kree Empire. Professor Xavier and Cyclops are visiting the X-Men in part to discuss recent activity by Magneto's Acolytes. For a long time (before I realized the exact timing of the issues involved), I always assumed this visit was motivated by the events of Uncanny X-Men #298 (in which we first see the Acolytes being active once again), but instead, this issue is setting up those events, and this represents the first time that Magneto's Acolytes are said to be back in action following their apparent deaths (save Cortez) alongside Magneto in X-Men #3, even though their specific actions cited here happen only off-panel. Carol Danvers aka Binary (at this time) leaves the Starjammers in issue #351, in an attempt to reconnect with her family and roots on Earth. She'll next appear in a run of Quasar issues, and we'll next see her in X-Men Unlimited #13. Given that issue #350 was published at a time when any issue with a number divisible by 25 warranted some kind of special treatment (and larger price tag) on the grounds that it was an anniversary issue, this features a triple gatefold cover (with the inside flaps reprinting a seemingly-random assortment of previous issues' covers) and is extra-sized, with the regular length main story accompanied by a comedic back-up story (featuring Jarvis and Inhuman nanny Marilla learning to coexist in Avengers Mansion), a few pages of Marvel Handbook-style diagrams of the new Avengers headquarters building, and a reprint of Avengers #53, the first time X-Men and Avengers directly crossed over with each other. The cover of issue #350 is, of course, another one of those classic "two teams run at each other from either side of the cover" covers, though it may also specifically be homaging X-Men #100, given the positioning of Professor X at the center of both groups. These issues are written by Bob Harras, longtime editor of the X-books, and issue #350 is drawn by Steve Epting, who will become the regular artist on X-Factor circa "Age of Apocalypse". Cyclops appears here between issues #11 and #12 of X-Men, Professor X appears between X-Men #11 and Uncanny X-Men #291, Quicksilver appears after X-Factor #83 and before the start of "X-Cutioner's Song", and finally, Val Cooper appears between X-Factor #83 and X-Men #12. All the characters appeared in "Infinity War", to varying degrees, just prior to these issues. It's noted that Deathbird, last seen in the X-books helping the X-Men free Xavier and the Shi'ar Empire from the Warskrulls in Uncanny X-Men #274-277, has been named regent of the remaining Kree Empire by Lilandra following the Shi'ar victory in "Galactic Storm". One development of this era I don't like: issue #350 features the debut of beardless Hercules, a look he'll maintain more or less up through "Heroes Reborn". Professor X mentions the need to inform Lilandra of his recent injury (at the hands of the Shadow King at the end of "The Muir Island Saga"), while Cyclops pulls Corsair aside to tell him about Maddie and Nathan (this is, I believe, the first time the pair have interacted since the Starjammers left Earth in Uncanny X-Men #177). It would have been nice to actually see those conversations unfold, but at least acknowledging those significant changes for both characters is an appreciated bit of continuity and characterization. 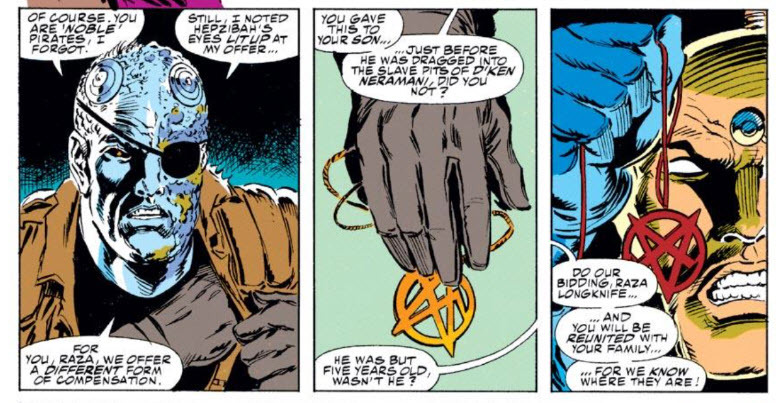 Issue #350 establishes that Raza once had a wife and son (something I don't believe has been mentioned before) while #351 reveals that Raza's cybernetic hand can be reformed into a blade. Hebzibah, Corsair's longtime skunk-cat-lady girlfriend on the Starjammers, is surprisingly-mercenary in this story, willing to kill Black Knight for money and not being particularly shy about it, a characterization that doesn't really gel with past (or future) depictions of her. These issues are, of course, deep in the Avenger's "Leather Jacket" Era, in which, much like the X-Men, several team members are prone to wearing jackets branded with the Avengers' logo over their superhero costumes. Ostensibly, I'm reviewing this pair of issues for a few reasons. One, they make for a handy introduction to the X-Men narrative the events of "Operation: Galactic Storm", something which will have at least a little impact on the X-books down the line (given the way it positions longtime X-allies the Shi'ar as the dominant empire in the Marvel galaxy for awhile). 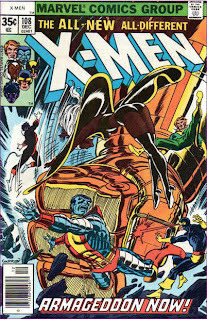 Two, via guest appearances from characters featured in two different X-books, it introduces the idea that Magneto's Acolytes, in some form, are active once again and could be a danger to Quicksilver's daughter, plot points the X-books will later pick up and run with, both in the lead-in to "Fatal Attractions" and then the more formal X-Men/Avengers anniversary crossover "Bloodties". Finally, these issues heavily feature the Starjammers, including both Cyclops' father and Carol Danvers, characters with a long history with the X-Men, and while their involvement in "Operation: Galactic Storm" wasn't enough to justify my including that entire 21-part epic as part of X-aminations (despite the presence of the Starjammers and the Shi'ar, it is without a doubt an Avengers story first and foremost), it's enough to merit a check-in here. But really, I wanted to touch on these issues just to show a little love for one of my favorite eras of the Avengers, the much-maligned "Leather Jacket Avengers" of the early 90s. This era of the team, specifically the Harras/Epting/Palmer run, was my introduction to the Avengers, and when I was first getting into comics, it represented my first non-X-Men steps into the wider world of the Marvel Universe. Critics (not incorrectly) peg it as X-Men Lite, with the series dealing in the kind of soap operatics and dangling, seemingly-neverending mysteries and subplots that had come to be associated with the X-Men, but for me, especially coming to this group of characters from the X-Men specifically, that was always a feature, never a bug (and I've defended the leather jacket for the X-Men before; it makes even more sense for a team like the Avengers to have some kind of uniformed look - the FBI have jackets that say "FBI" on them and other branded apparel, why not the Avengers?). If the goal in making the Avengers more like the X-Men was to get some of the larger X-Men audience to check out (and stick around for) the Avengers, it worked, at least with me, and I became a devout fan of the series and its rich history from that point forward (I now consider my Avengers' fandom second in comics only to my X-Men fandom). In hindsight, there's no denying some of the flaws of this era of the book, and I've come to appreciate other Avengers runs more (chiefly the Stern/Buscema issues, though between that run and this one, I've always had an inflated sense of the importance of both Black Knight & Hercules to the Avengers' mythos), but I still carry a lot of affection for this stretch of issues (and the Epting/Palmer art remains some of my all time favorite). These two issues, dealing mostly with "Galactic Storm" fallout while playing up the connections between the Avengers and the X-Men for more direct commercial effect (something that will be done even more in earnest about a year later, when both books are celebrating their 30th anniversaries), aren't necessarily the best snapshot of what I love about this era of the series (especially with Epting and Palmer taking #351 off), but they do capture much of its spirit, with the romantic angst and interpersonal drama getting as much attention as the super-powered fighting, while also offering some legitimate connections to the larger X-Men narrative. Tomorrow, Spider-Man gets Phoenixed up in Spider-Man #25. Friday, Wolverine gets a haircut in Wolverine #59. Next week, Uncanny X-Men #292. Hangar. I tend not to flag plain old typos out of respect for the general sleep deprivation that comes from having a toddler; since you repeated it, though, and it’s an oft-confused homophone, it seemed to merit correcting. I don’t care for beardless Hercules either, but that pales in comparison to the disappointment of Steve Epting’s pencils in #350 giving way to Kevin West’s in #351. Par for the course, unfortunately, in that my first exposure to West was as Kevin Maguire’s blown-deadline-induced replacement on 1991’s Adventures of Captain America miniseries. Can’t blame Scott and Xavier for skipping out early. Speaking of Kevins: The penciler of #350’s back-up story, Kevin Kobasic, was also Don Daley’s assistant editor and someone we, Austin, knew as Kevie over at Nikki Stafford’s blog during the Lost days. I met him all real-world face-to-face like in NYC a few years ago. His stuff is much, much better now. While it came up plenty earlier this year, for some reason only now when I read the word “Acolyte” did it play in my head to the tune of Dave Matthews’ “Satellite”. You can now all share the misery. Inhuman Nanny is my new band name. "It would have been nice to actually see those conversations unfold"
People having conversations about Maddie off panel was a common occurrence this time period- Scott told his grandparents about Maddie off panel in X-Men 22 and Cable about Maddie off panel in Cable 8. Numerous readers thought it was ridiculous that Sersi couldn't heal Dane- if she could turn a person into a pig, then why couldn't she turned an injured person into a healed person? Does this mean you'll be doing a deeper dive into the Harras/Epting Avengers? I hope so. Although (at that point in time) I had already been reading X-Men for a few years, this iteration of The Avengers was my first excursion outside of the X-titles, so I have a soft spot for this run as well. Particularly, once the whole Proctor/Gatherers arc starts. Someday I'll read the Harras AVENGERS run. Much as I defend him as an editor, I've read very little of his writing. It's probably all on Marvel Unlimited, but I'd love to own it in Epic Collection format. I do have a soft spot for the era in any case, though, since a friend of mine was a semi-regular reader in middle school and I liked to peruse his issues, even if I didn't read them very thoroughly. Thanks to those days, I have the same overstated sense of Black Knight's and Hercules' importance to the team, and I consider Sersi and Crystal major Avengers, too -- plus, Black Widow is probably my favorite Avengers leader after Captain America, and I think I like the Avengers Compound as their headquarters more than the mansion or Hydrobase. I love the design of the building. I agree with you on the jackets, by the way. It makes perfect sense to me the Avengers might have them. I also liked the jumpsuit uniforms their support staff wore (plus the fact that they had such a big staff! That said, my only real objections to the jackets are 1) When Black Knight starts wearing his exclusively, complementing it with stringy hair and stubble, and 2) whenever Captain America wears one. It just looks wrong on him! It just recently came to my attention that Crystal -- the only Inhuman I'm actually able to muster up any sort of enthusiasm for -- was an Avenger for a time, thanks to the "Bloodlines" TPB. As such I'm greatly interested in her timeline with the team.